European leaders announce plans to take in tens of thousands of refugees. 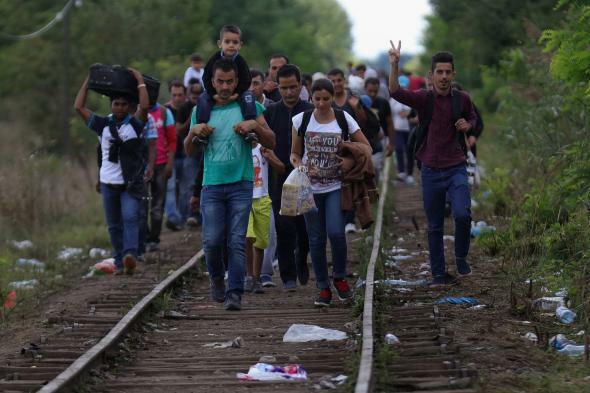 Migrants and refugees cross the border from Serbia into Hungary on Sept. 6, 2015 in Szeged, Hungary. As the Syrian refugee crisis continues to land on Europe’s shores, the continent’s leading governments at last began to step up their effort to cope with the influx of Syrians and provide aid. Germany, the U.K., and France all offered to accept tens of thousands of people fleeing the war-torn country (and beyond) as pressure continued to build at access points to Europe. The German government said over the weekend it is committing some $6.6 billion to support arriving refugees, of which German officials predict there will be 800,000 before the end of the year in Germany—predominately from Syria, Iraq, and Eritrea. U.K. Prime Minister David Cameron said the country will accept as many as 20,000 Syrian refugees over the next five years as part of a larger effort to provide assistance to recent refugees. French President François Hollande on Monday committed to accepting another 24,000 asylum-seekers over the next two years. The moves come as more than 310,000 people have crossed over the Mediterranean, many on overcrowded, rickety boats, to reach Europe so far this year, according to the U.N. Recently, Macedonia and Hungary have seen streams of refugees left stranded while trying to reach Greece and Germany. Hollande also said a plan to distribute 120,000 people over the next two years across Europe would be presented to the European Commission this week.